You might think things like automatic braking and hands-free parking would put a dent in insurance costs. Not so much. New technology makes some cars smarter than their drivers: Automatic braking systems slow or stop cars to prevent collisions. Lane-departure warning features alert drivers with sounds or vibrations when their cars drift across lane markings. Self-parking systems can expertly back vehicles into tight spaces without drivers touching their steering wheels. With more vehicles hitting the road with these and other safety features, you would think car insurance rates would drop along with accidents. But the cost of accidents and auto insurance have risen sharply in recent years. Federal Consumer Price Index data shows car insurance prices jumped 7.9% in 2017 and 7% in 2016, the biggest annual increases since 2002. For one, a lot of older cars are still on the road. Even if the new safety features ultimately reduce crashes, it will take time for them to make a dent in the accident rate. The average age of cars on U.S. roads is over 11 years, according to IHS Markit, a research and analytics company. For another, we’re driving more than ever, thanks to a better economy and job market, says Joe Salerno, vice president of claims for the Arbella Insurance Group. 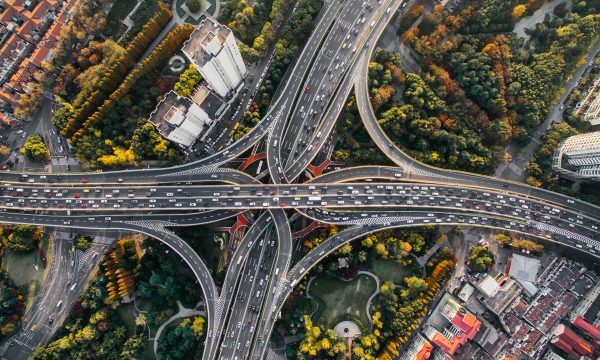 Drivers logged more than 3.2 trillion miles on U.S. roads in 2016, the fifth straight year that U.S. mileage increased, according to the Federal Highway Administration. Miles driven from January to September 2017 were up 1.3% compared with the same period in 2016. More miles means more accidents. And more accidents leads to more drivers filing insurance claims, says James Lynch, chief actuary for the Insurance Information Institute, a trade group. The number of collision insurance claims per insured vehicles has crept up every year since 2013. In the second quarter of 2017, collision insurance claims filed totaled 6.12 per 100 insured vehicles, compared with 5.56 claims per 100 insured vehicles in the first quarter of 2013, according to the institute. That’s a 10% increase. “What’s happened in the last three or four years is both the accident rates have been going up, and the size of the claims have been going up,” Lynch says. Both medical and car repair costs are rising. 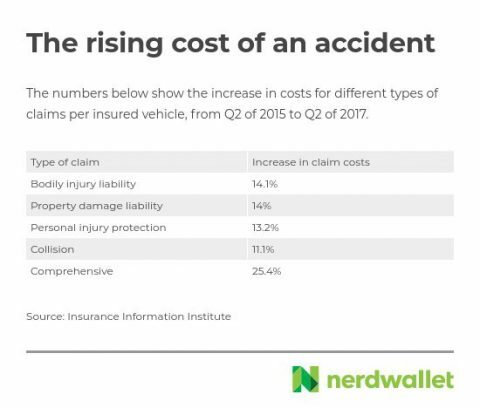 Insurers’ costs to pay and administer claims went up 11% or more per insured vehicle in the past two years, depending on the kind of claim, the Insurance Information Institute says. Technology is partly to blame for the higher costs. New bumpers, for example, include equipment, such as cameras and lane-departure and backup sensors. The bumper on a 1990 Honda Civic had fewer than 10 parts, Salerno says. A 2016 model has over 30. According to Arbella claims information, windshields on cars with advanced driver-assistance systems, such as adaptive cruise control, can cost 82% more to replace than vehicles without those features, Salerno says. In addition, changes in vehicle composition, including the increased use of aluminum, boost labor costs for repairs. “The complexity of repairs is greater and requires a higher skill set,” he says. “These features are still new and so far very few vehicles on the road are equipped with them,” says Russ Rader, a spokesman for the Insurance Institute for Highway Safety, a research and educational group supported by insurers. Another challenge for insurers is confirming whether a vehicle has those features. Usually, they get a snapshot of a car by checking its vehicle identification number, or VIN, a unique 17-digit code created by the automaker. The VIN identifies the car’s specifications and manufacturer but doesn't include whether a vehicle has advanced crash-avoidance features like automatic braking. Although advanced safety features might not yield a discount yet with many insurers, Rader says they’re worth considering when buying a car.